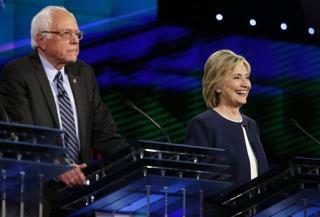 (Newser) – The Iowa caucuses and New Hampshire primaries are just weeks away—and the latest polls suggest that Hillary Clinton will have plenty of sleepless nights before they arrive. According to a Wall Street Journal/NBC News/Marist poll, Bernie Sanders is neck-and-neck with Clinton in both states, with her 48% to 45% lead in Iowa and his 50% to 46% lead in New Hampshire both within the margin of error. Donald Trump, meanwhile, is behind Ted Cruz in Iowa, 28% to 24%, with Marco Rubio in third at 13%, but has 30% in New Hampshire, where Rubio has 14% and Cruz 11%. Ben Carson is in fourth place in Iowa with 11%, while Jeb Bush's 9% leaves him tied with John Kasich for fourth place in New Hampshire. Democrats already have a socialist in office. What's one more. At least his wife has not spent 30 years bonking other women.